We all use sunscreen to protect our skin, but don’t forget to protect your eyes as well. 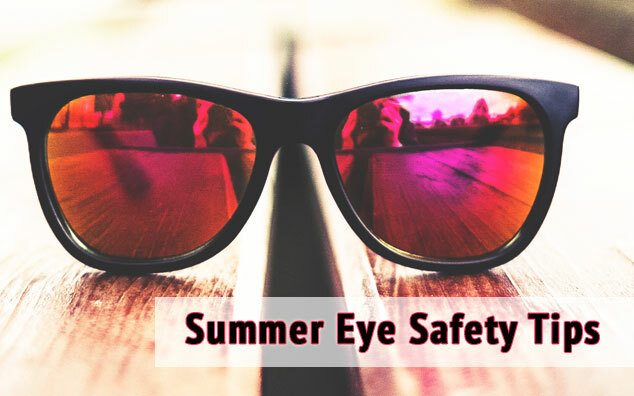 Summertime means more time spent outdoors, and studies show that exposure to bright sunlight may increase the risk of developing cataracts and growths on the eye, including cancer. The same risk applies when using tanning beds, so be sure to protect your eyes from indoor UV light as well. Sunlight reflected off sand and water can cause photokeratitis, the condition responsible for snow blindness, but beach and pool-goers need to be aware as well. Wear a hat: In addition to your sunglasses, wear a broad-rimmed hat to protect your eyes. Don’t be fooled by clouds: The sun’s rays can pass through haze and thin clouds. Sun damage to eyes can occur anytime during the year, not just in summertime. Protect your eyes during peak sun times: Sunglasses should be worn whenever outside and it’s especially important to wear sunglasses in the early afternoon and at higher altitudes, where UV light is more intense. Never look directly at the sun: Looking directly at the sun at any time, including during an eclipse, can lead to damage to the retina. Don’t forget the kids: everyone is at risk, including children. Protect their eyes with hats and sunglasses. Click here for the printable, PDF version. July 10, 2014 in Health.